On arrival, you’ll be warmly greeted and escorted to the exclusive Belmond Miraflores Park. General Tours luxury hotel offers a privileged oceanside setting in one of the capital’s most vibrant and exclusive districts. After a leisurely breakfast, you’ll join General Tours engaging guide, an in-the-know city native, to explore the splendid Colonial-era landmarks, colorful neighborhoods and vibrant city life of the capital. Just outside your hotel’s front door, you’ll begin with a walking tour through the inviting district of Miraflores - popular with city residents who come here to stroll and enjoy the shops, restaurants and fine views over the Pacific. After an early breakfast, you’ll be escorted to the airport for your included flight to Cuzco, the ancient capital of the once vast and mighty Inca Empire. On arrival in this high-mountain city, you’ll meet Carlos Seminario, General Tours resident Andean expert on the ancient Inca and contemporary Peruvian traditions. Journey with him into the picturesque Sacred Valley to visit the Cochahuasi Animal Sanctuary where you will see endangered Andean species and learn about their work to preserve these creatures – including condors, macaws, parrots and even wild cats like the puma. You’ll want to arise early today to take advantage of General Tours lodge’s one-of-a-kind setting. As the only hotel next to Machu Picchu, you’ll be among the first to enter the site this morning. 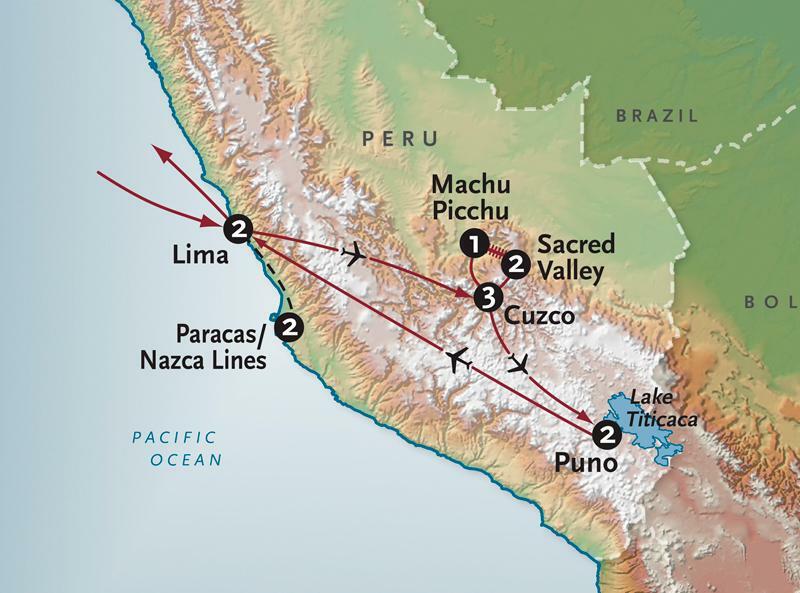 At this early hour, the day-visitors from Cuzco and the Sacred Valley have yet to arrive and even those who spent the night in the town below will still be making the 20-minute ascent. With fewer people and the softer light of morning just breaking over the mountain peaks, this early-morning visit to Machu Picchu is one of the most memorable travel experiences you will ever have. Lake Titicaca is one of the highest lakes in the world and the largest in South America. Its beauty is breathtaking to behold and its sacred waters have been revered since pre-Inca times. Titicaca is perhaps best known for its amazing floating islands - made of Totora reeds and home to small but vibrant communities of the Uros people. This morning, you’ll set out with General Tours expert guide to cross the waters and step ashore on these remarkable manmade structures. As you learn firsthand about their construction and maintenance, and the secrets behind their buoyancy, you’ll also gain insight into the history, traditions and daily of the Uros. You’ll also visit Taquile Island, famed for ancient agricultural terraces that climb the hillside from the lakeshore; its residents still speak the language of the Inca and weave beautiful textiles using techniques that have changed little over the centuries.